Published December 27, 2011 By Anna T. This post may contain affiliate links. Regardless, I only recommend sites I've researched and/or used and trust. Please note that they may or may not be actively recruiting workers at this time, although the employment page is always up on their website. First – what is transcription? If you don't know what transcription is, basically you are listening to an audio file and typing out what you hear. This isn't as easy as it sounds. You need to have a good ear and be able to pay very close attention to detail. Also, different companies have their own specific guidelines and styles you must follow. Transcription is a potentially lucrative way to earn a living from home, plus it's possible to break into general transcription without any experience. However, getting in some general transcription training before applying may help your chances of landing a better-paying job. How much does Tigerfish pay? 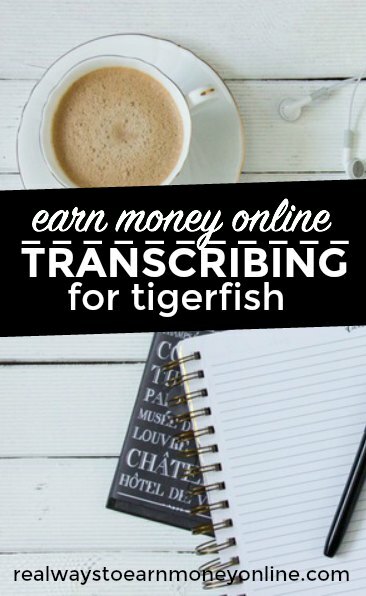 Tigerfish doesn't list their pay rate publicly, but a person on the WAHM forum stated that they pay a half cent per word. Definitely take that info with a grain of salt since it came from a public forum. If anyone can confirm the pay rate, feel free to comment below and share it with us. Does Tigerfish hire outside the US? Not at this time. They only hire people who are legal United States citizens. If you are living outside the US and you need a work at home job, I have a list that may help with worldwide work at home resources. What are the technical requirements to apply at Tigerfish? You need high speed internet, a Windows based computer, and a phone number where they can reach you. Additionally, you'll have to download a free program called Express Scribe to take the test. If you're accepted, Tigerfish explains you'll need to buy Start Stops Power Play for Windows Media to do the actual work. This equipment is around $200 brand new unfortunately, but I would bet that you could look around on eBay or some other site and find it much cheaper if you tried. I can't find any information on whether or not Tigerfish reimburses you for this after you start, but I'm concluding that they probably don't. Tigerfish asks that you download and read their style guide prior to testing. Then, you have to listen to and transcribe three different audio files. The company has specific instructions on exactly how to do this on their employment page. When you're done, you email the files to them along and indicate how long it took to transcribe each one. How long does it take to hear back from Tigerfish? Tigerfish claims to get tons of emails, and for this reason it might take a little while to hear back (if you do at all). So applying and receiving an immediate response isn't likely. If several months go by and still nothing, it may be worth trying again. What do people say about Tigerfish? I have so far read nothing negative about them, other than that some people apply and don't hear back. Here's a thread on WAHM where some people are discussing them. The thread is from 2012, so it's pretty old. Visit the Tigerfish employment page here and follow the test directions to start.